You really cant beat this deal. 6 high quality frames and screen for about $100.00 with FREE SHIPPING. If you go to the trade shows, other say they can match or better this deal ... they cant. In some cases, a few have only lasted me a year. Maybe it is the solvent in my dip tank eating the glue but really who cares, these screens are so inexpensive, that they are almost disposable .... and FREE SHIPPING!!!! Quick shipping, the price is right, and screens are nice and tight! What more could you ask for? We have purchased screens from Goldupusa for 5 years and their quality and fast shipping is great. 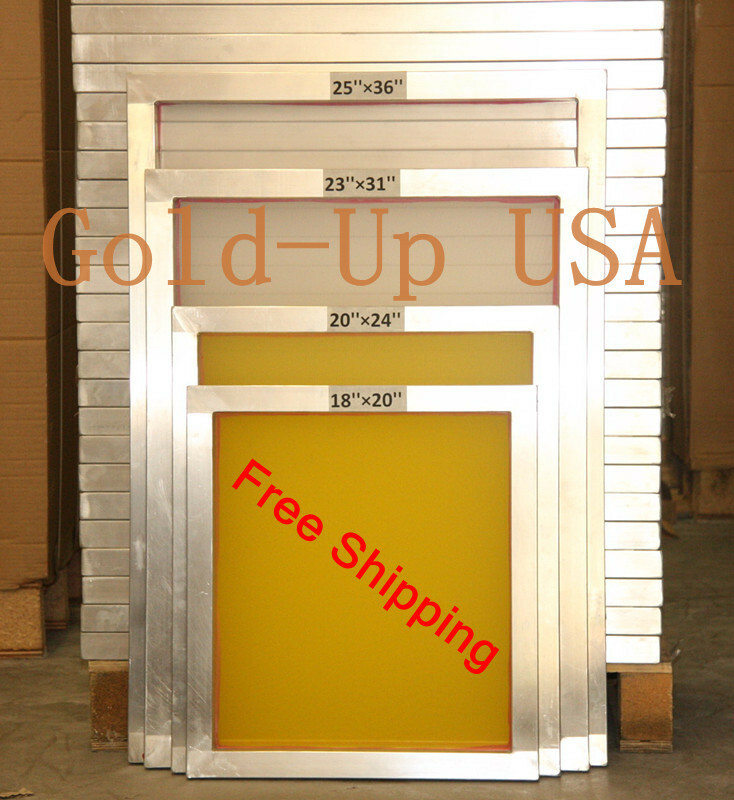 I have been using aluminum 20 x24 Gold UP USA screens for the past 4 years. Including mesh ranges from 110 to 305. I have tried screens from other manufactures/distributors and found that the main difference for me was the others may have a bit heavier frame. They print just as well as the others I have tried. Mesh strength may be a bit questionable as I have ripped through a few screens while reclaiming. But overall a great value aluminum screen. These are really nice screens. They are well constructed, sturdy and light weight. An extra bonus is that the nice people at Gold-up will mix the mesh count, giving you flexibility for printing a variety of detailed designs. Awesome Screens best screens fast shipping great price! These are great screens. I’ve been printing 11 years as recently found this company and decided to try the screens. Awesome quality and printing. Hands-down, the best screens I’ve ever used. Top quality.. I’ll only order from here. I keep coming back because these screens are top quality. Not only that, but you get 6 (20x24) screens for $100 plus free shipping. Goodluck finding any other website to match that. Click the button below to add the 6 Pack Aluminum screen printing screens AL20"x24"- Free Shipping to your wish list.